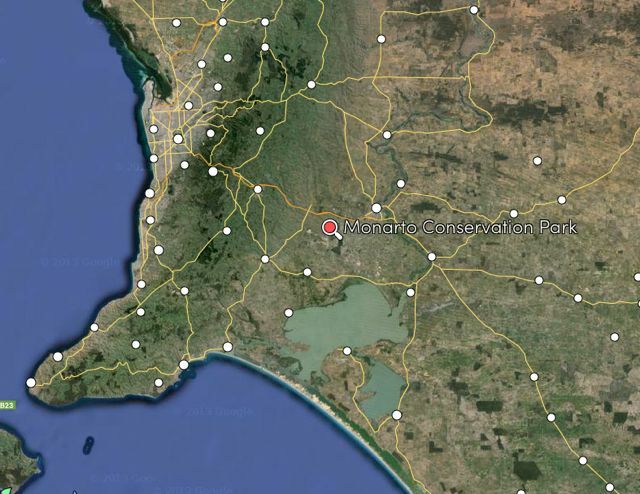 Late yesterday afternoon (Sunday 26th April 2015) I rushed home from work (obeying the speed limit) and packed the 4WD and headed down the road to the Monarto Conservation Park, VKFF-828. I have activated this park many times before but I wanted to activate the park with the special AX prefix for the ANZAC Day weekend. 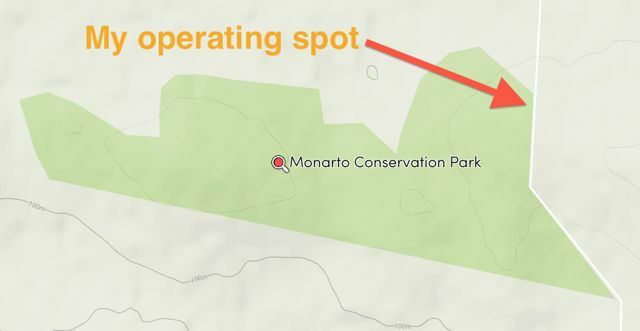 I was hoping to activate the Belair National Park on Saturday after work, but the weather all day on Saturday was terrible. We had lots of rain both in Adelaide and up in the Mount Lofty Ranges. Fortunately the rain had cleared by Sunday afternoon, so all systems were go. For this activation I used my Yaesu FT-857d and the 40m/20m linked dipole on the top of the 7 metre squid pole for this activation. I set up in my usual spot, the north eastern corner of the park, just off Ferries McDonald Road. I was set up in the park ready to go by 4.30 p.m. I struggled to find a clear frequency on 20m as there was a JA Contest running and the JA stations were very strong and were spread across the 20m band. But I did eventually find 14.274 clear and started calling CQ there. My first taker was John VK5BJE in the Adelaide Hills. John had responded to an SMS message I had sent out to some of the keen VK5 Parks hunters. The SMS alerting system that I employ seems to work very well. This was followed by Rod AX2TTL and then my first DX contact Xaver DK4RM in Germany, followed by Swa ON5SWA in Belgium. I was kindly spotted on the DX Cluster by some of the DX stations and this resulted in a steady flow of callers from Europe, North America, and Japan. Unfortunately after operating for about 15 minutes a JL1 station came up 1 kc below me and started calling CQ Contest, and this resulted in a lot of QRM and made it incredibly difficult to pick out anybody who did not have a strong signal. But I boxed on and managed 33 contacts, before having a tune around the 20m band and found VI4AE2 calling CQ on 14.269. 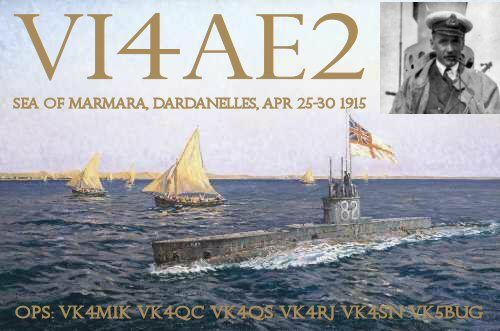 This was a special call for the ANZAC commemorations, particularly to commemorate the service of the officers and sailors aboard the Royal Australian Navy submarine HMAS AE2 who fought gallantly in the Dardanelles and Sea of Marmora for just 5 days before being blown to the surface by the Turkish torpedo boat Sultanhisar. I then headed up to 14.310 and started calling CQ DX again. My first contact there was with John VK2FR, followed by UR7ET in Ukraine, and then Pehr OH6IU. I was kindly placed on the DX cluster by Albert S58AL and this resulted in many of the European park hunters giving me a call. I worked a total of 15 stations in Europe, USA, and Canada on this frequency until being pushed off the frequency by another contester. So I tuned around the band and found VI6ANZAC calling CQ on 14.145. It was great to get a second ANZAC special event call in the log and it was certainly a very strong signal coming in from Western Australia. I then lowered the squid pole and put the links in on the 40m/20m linked dipole and found 7.150 clear. I asked if the frequency was in use and before I even got the opportunity to call CQ, I was called by Paul AX5FUXX at Wellington on the Murray River. This was followed by Adrian AX5FANA on the Yorke Peninsula, and then Tony AX5FTVR at Strathalbyn. I worked a further 31 stations in VK2, VK3, VK4, VK5, VK6 & VK7. It was pleasing to see a number of the VK’s using the special AX prefix for the ANZAC Day weekend. We only get to use the special AX prexix, three times a year: Australia Day, ANZAC Day, and World Telecommunications Day. 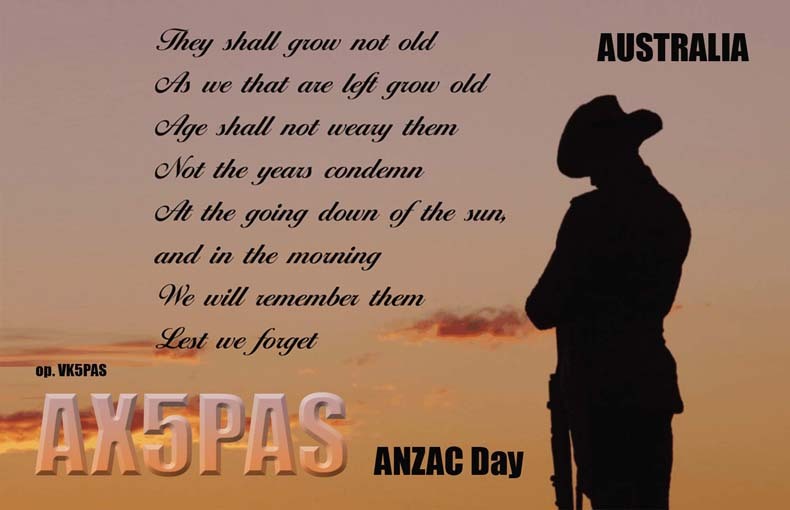 I have a special AX prefix ANZAC Day QSL card on offer. For VK stations, please QSL Direct to PO Box 169 Mount Barker SA 5251. Please include a stamped self addressed envelope. For DX, please QSL via my QSL Manager, M0OXO. After sitting in the park for about 2 & 1/2 hours I had a total of 84 stations in the log, including 42 DX contacts. Again it was very pleasing to get a handful of calls from the USA and Canada. Good work Mate, Could here almost all your contacts but not a sign of you!! Sorry I missed you mate. I did go back to 40m for a short time after 20m and worked quite a few VK’s. It was probably “beer o’clock” for you mate when I was there. Ha! no worries Mate you seem to have got enough without me! It was another good activation. The parks programs have certainly taken off here in Australia, which I am very pleased with. It is quite easy to fill up your logbook now whilst out in a park. It was pretty slow going when it first started off, but nowadays you end up with lots of hunters.